New York City’s 500 mile waterfront beckons commercial and residential development, accelerated by tax-subsidized affordable housing policies and rezoning. After centuries of neglect or industrial uses, miles of waterfront are now accessible for the first time. That 500 mile shoreline also exposes the city to the effects of rising sea levels and extreme weather events. Waterfront development is especially vulnerable, and can in turn contaminate waterways with rainwater and sewer water runoff. Today, New York City sits at a turning point between development and sustainability. Only New Orleans has more people living less than 4 inches above high tide. 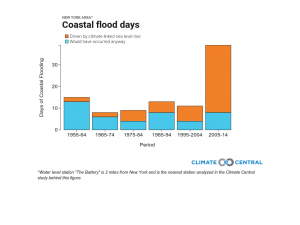 According to “Climate Central,” NYC has the highest population count in the country of people living within the rising tide increasing the risk. Clearly, prioritizing a pro-active environmental coastal policy is essential to a sustainable city. Coastal policy protects not just our waterways but the private and public investment that is bringing New Yorkers to their waterfront. 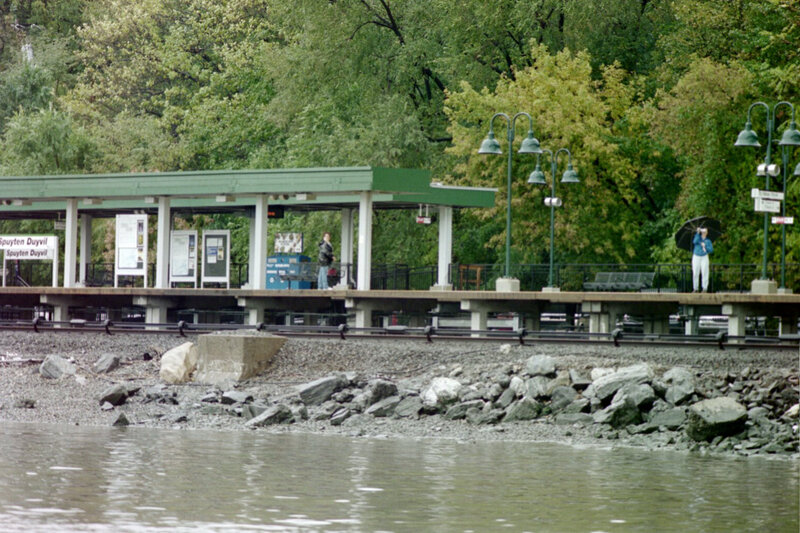 Waterfront development should not occur without it. Let’s say the City redevelops 50% of the existing waterfront to capture all the stormwater that falls in a given watershed. This can be attained by creating a sponge like ribbon of natural areas feathered along our shorelines. The design guideline must be changed from the standard of capturing smaller rain events, to aim for “zero discharge” up to the largest more intense events predicted. Using a sustainable green infrastructure (GI) to design waterfront parks and coastal infrastructure redevelopment (such as the Waterfront Alliance’s WEDG certification) can achieve zero discharge, be aesthetically pleasing, and manage a natural waterfront with access for all. Unfortunately, waterfront development is bringing high rise apartment buildings without built-in green infrastructure or non-permeable surfaces and sidewalks to our shores — even those planned are for the standard rain event and won’t hold water. Under good coastal policy, hardscape development belongs inland, not in flood zones along the waterfront. It is wasteful and endangers the public even if they live on higher floors. This was attested to in a 2012 New York Times article about the impact of Sandy on NYCHA residents. The then Brooklyn Borough President Marty Markowitz said: “Senior citizens and the disabled were especially impacted by the lack of essential services available in Sandy’s aftermath, as they were effectively held hostage on the upper floors of their apartment buildings.” New York Times, NY Region, December 12, 2012 Must we go through the horrors of Sandy again? Leaders can make choices to build high rise buildings inland on the upland, and strengthen the waterfront with natural green infrastructure. from the Harlem River over upland and across a street to the fence. What about our transportation infrastructure like the Metro North, the Subways or the tunnels? 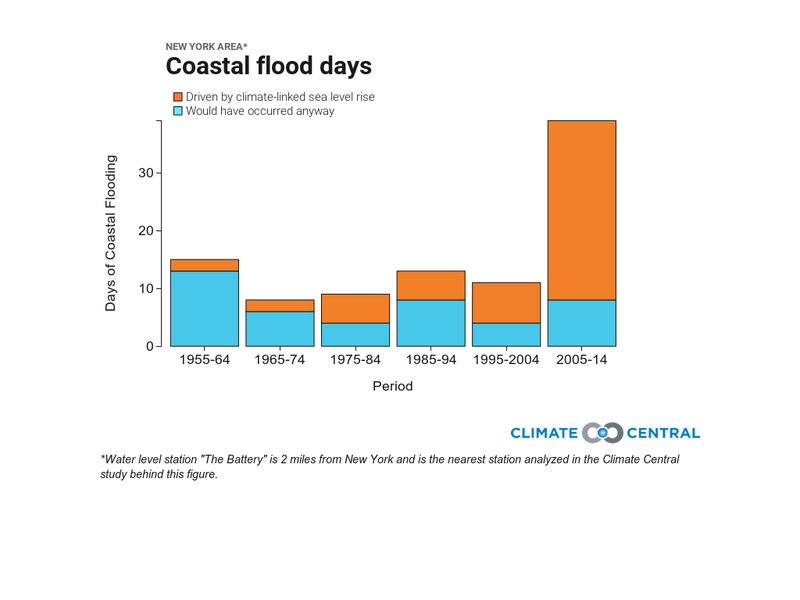 What will the rising tide do to Con Ed power plants along the shores? Over a hundred years ago, city planners approached our waterfronts as commercial enterprises – leaving us with a variety of underdeveloped former industrial or railroad uses. 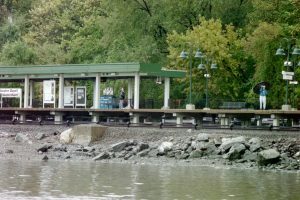 The Harlem River has a rich history of large boat docks and clubs for recreational use. 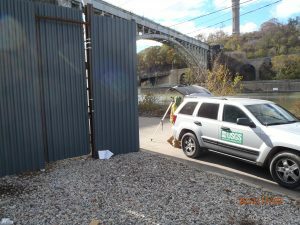 Today, there is much to learn from the mistakes of the past, and waterfront development along the Bronx side of the Harlem River is an excellent example. 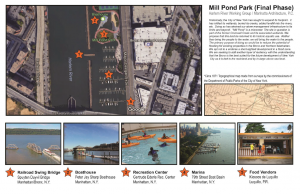 Mill Pond Park can be used to illustrate designs that increase storm water runoff. EPA guidelines give a good description of what happens when you increase impervious surfaces — even by 10%. 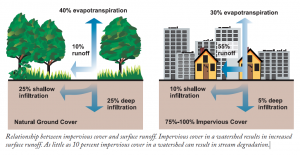 In the first drawing, the natural setting has 10% runoff, 40% evapotranspiration (a cooling effect), and infiltrates 50% to the ground. Note the amount of runoff increases from 10% in the natural ground cover to 55% in the 75% impervious cover. Clearly, if you want to decrease the amount of runoff along the waterfront and flooding in shoreline areas, increase the natural ground cover as much as possible. Is parkland the answer? It depends. 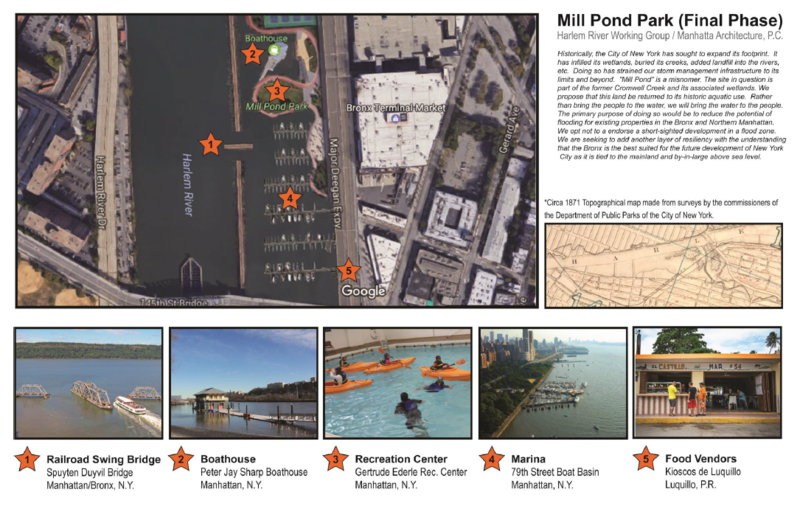 When we build waterfront parks, they should be distinctive and unique from upland-located parks: natural without asphalt, incorporating passive not recreational uses. That means no tennis, racquetball, or basketball courts, which in coastal policy terms are as bad as parking lots. Oh yeah, parking lots should be avoided on the waterfront. Parks at the water’s edge and the greenways that connect them need to be sponges to lower runoff on land. Mill Pond Park from Building J Parking lot to the passive park is a good example of what not to do. Estimate the area at about 50% impervious, with the Passive Park area at about 10%. In order to compensate, there should be no more impervious surfaces on the extensions both north and south of the park. Only natural plantings and passive park activities will manage stormwater. Unfortunately, the city is proposing to build on Pier 5 adding at least another 30% impervious to the blocks total. The Sandy surge hit the park at low tide, and the water, measured by USGS as 8 feet high by the Tennis Courts esplanade. If it was high tide, water may run across Exterior Street as the sewers are directly discharging into the river. Garey’s proposal will be greeted with skepticism by city planners. How can we turn our back on affordable housing and modern progress that is developing our shoreline? But without the vision supplied by the natural history of New York City and its beautiful topography, our best efforts to bring New Yorkers to our waterfront will lead to environmental impacts and expenses that no city can afford. THIS ARTICLE, ORIGINALLY PRESENTED IN THISISTHEBRONX SUNDAY MAGAZINE ON 2.11.2018, HAS BEEN UPDATED AND EXPANDED BY THE AUTHOR.